I have been involved with writing various accounts of military service, including members of the Welch Regiment and a recent article (see link below) was instigated by information received from an ex-North Cyprus resident, Tony Woods, who many people will remember for his association with the Kyrenia Amateur Dramatic Society and other theatrical events during his time in Cyprus. For those people who knew and remember Tony I am giving a few reminiscences about him at the end of this article. Tony’s father was also a long-service member of the Welch Regiment and I would like to record some information about him and his long military career. 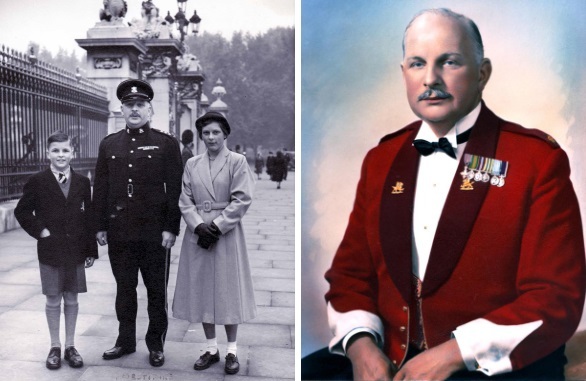 Major George Samuel Thomas Woods MBE, 1911 – 1994…. 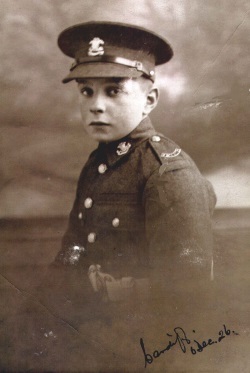 My Pontypridd-born father enlisted into the Second Battalion of The Welch Regiment in Cardiff as a Band Boy at the age of 15. He was soon transferred to the First Battalion in which he remained, bar a short transfer to the East Lancs to receive a commission, until he retired at the end of his service in 1962. My father was a career soldier in the Welch from band boy to retirement but missed out on the posting to Cyprus. While stationed at Pembroke Dock in the late 50s I joined him and stayed with Major Dicky Randell and his lively family – a great holiday. 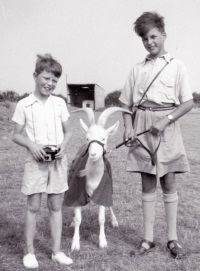 I am including a photograph of Major Dicky Randell’s son and myself taken with Taffy, the Battalion Mascot, on a windy day at Llanion Barracks, Pembroke Dock in 1955. Major Randell’s name has cropped up in a number of articles written on cyprusscene.com about the Welch Regiment. My sister. Elaine, and I were proud to join my father at Buckingham Palace when he received the MBE in 1953. In 1960 after amalgamation when the Welch became the Royal Regiment of Wales, my father was the last person to leave Maindy Barracks in Cardiff on the way to Cwrt-y-Gollen and a photo was published in the Regimental Journal of him with his boxer dog ‘Cobber’ walking out through the gate. Following my father’s death in 1994 there was an obituary in the Men of Harlech Journal which is shown below……. George Samuel Thomas Woods died on 7th February 1994, aged 83 years. He had been ill for over a year with a painful and distressing illness which he bore with dignity and courage. George Woods had a long and distinguished record of service – with his Regular Army service of 36 years and then his 14 years’ service with the Territorial Forces, he served altogether for 50 years.He was born on 22nd June 1911 and enlisted in Maindy Barracks, Cardiff on 20th May 1926 aged 15 years, as a Band Boy and was posted to the 2nd Battalion The Welch Regiment at Tidworth. He then went to the 1st Battalion The Welch Regiment at Gosport. He progressed steadily to L/Cpl in 1931. Cpl in 1934, Sgt and Band Sgt in 1936. CQMS in 1940. WO 11 (CSM) in 1942. He was commissioned Lt (QM) on 31st October I94S. and then attached to the 2nd Battalion The East Lancashire Regiment in India until 1947, then attached to No. 1 Section Battalion RAOC Aldershot as QM until 1950, and then posted as QM East Africa Training Centre, Nakuru. Kenya, until 1951. 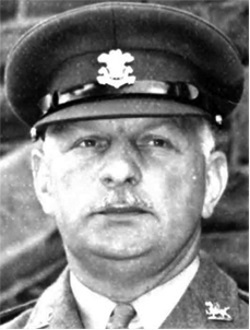 He was promoted Captain (QM) in June 1951 and rejoined the 1st Battalion The Welch Regiment in Colchester. He served with them in Korea in 1951/52, in Hong Kong in 1952/53, and in Pembroke Dock in 1953/56. He was promoted Major (QM) in June 1956. He then served as QM The Welch Depot, Maindy Barracks, Cardiff 1956/60. When the Welch Depot closed in June 1960 he served as QM of The Welsh Brigade Depot at Cwrt-y-Gollen, Crickhowell until he retired from the Regular Army on 23rd June 1962. He was then appointed Stores Superintendent Glamorgan TAFA Cardiff and lived in Dinas Powis. He retired from this position on 23rd June 1976 – having reached the age-limit for service – 65 years, and so completed 50 years’ service in the Regular Army and in the Territorial Army. He was awarded the MBE in June 1953. All George’s Regular Army service – apart from some short attachments – was with The Welch Regiment, so naturally, he was very much a Welch Regiment man. but, when the South Wales Borderers and The Welch Regiment were amalgamated to form the Royal Regiment of Wales (24th/41st Foot) in June 1969, George took the greatest interest in, and was a very loyal supporter of, all things concerning the new regiment. He was a kind and considerate man, always ready to help, if he could, anyone who asked him for advice. He was always especially patient with, and helpful to, young inexperienced subaltern officers who all called him: “Uncle George” when they were young, and also when they were older and had reached more senior rank! He was not a particularly good athlete, but he played all games, and certainly supported all Battalion games, very enthusiastically. After he retired in 1976 he became Chairman of the Dinas Powis Branch of The Royal British Legion, and President of the Dinas Powys Bowls Club – where The Welch Regiment Bowling Team now play their matches. His funeral at St Peters Church. Dinas Powis on 10th February 1994 was very well attended and showed how greatly esteemed he was in the area. The Cremation Service afterwards at Thornhill Crematorium. Cardiff, was equally well attended – mainly by his old Army friends, and also showed how well liked and popular he was with his old comrades. We extend our deepest sympathy to all members of his family in their sad loss. George Woods was a fine man in every way and he will be greatly missed by all of us who had the privilege of knowing him. After numerous annual holidays in the TRNC I arrived to retire there in January 2002 with 2 cats and returned to the UK on 21st September 2015 with 4 local cats – such is life Kibris-style. As Anita had joined Kyrenia Animal Rescue on one of our many holidays in North Cyprus, it was sensible for me to join the group. 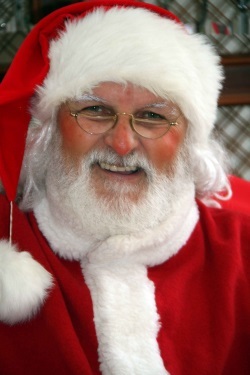 This I did and started in 2002 to be the KAR Father Christmas at their Annual Christmas Bazaar – only missing one year due to ill health. Each Dog Show saw me taking photos for the animal charity. There was hardly a KAR fundraiser that I did not attend and photograph from arriving on the Island to leaving it. I am sure that Denise Housego Phillips [aka ‘Radio Angel’] will now not remember interviewing me at Palmera Rouge in 2002 as I stayed steadfastly in my Noel Baba character. I eventually became that character for Girne Belediyesi Christmas event in Baris Park. In 2003 I was invited by my next door neighbour to write articles for a monthly magazine, North Cyprus Magazine, that was published by Freebirds in Girne. The same company in 2005 published a new weekly English language newspaper and I was asked to join the group of Turkish young people and one American. The latter and I were originally proof-readers of the translated Turkish online news before becoming writers and even photographers and page designers. It was here that I met the regular weekly contributor the English expat writer Brian Self. 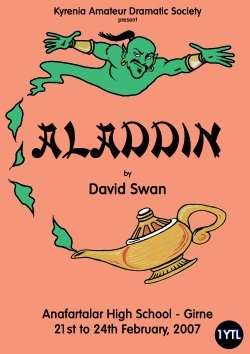 In 2006 I was somehow inveigled into the chairmanship of Kyrenia Amateur Dramatic Society and produced the poster, programme and painted the scenery for the following year’s panto. Many other shows followed that needed similar input from me as well as me being able to perform [as I had no memory but could read a script] in the KADS radio plays that Can Gazi kindly produced at BRT and arranged the transmission of for us. It was a very happy and busy time. My theatrical programme producing skills were used by TheatreLambousa and for the lengthy varied fundraiser for the Cheshire Home in 2011. Later that year I was requested to be the official photographer of the newly formed Kyrenia Branch of the British Royal Legion – a position I enjoyed until my cancer immobilised me the following year. This entry was posted in British friends, Entertainment, Friends Pages and tagged George Samuel Thomas Woods MBE, Kyrenia Amateur Dramatic Society (KADS), Kyrenia Animal Rescue (KAR), Maindy Barracks Cardiff, Tony Woods, Welch Regiment. Bookmark the permalink.